From the outset, this seems like a fairly logical question. Take the wine at one of our Fairtrade Cheese & Wine evenings, for example: is it right for us to promote Fairtrade wines when they have to be shipped a distance of nine thousand kilometres from South Africa? For the most part, I have tended to follow the unspoken line from Greenspace, that as Environment Reps already promote locally grown and organic produce, it makes sense for us to look after our ethical responsibilities for foods that cannot be grown in the UK mainland. More and more though, I am starting to realise the benefit Fairtrade has in looking after the planet. This was highlighted to me recently in a debate over lunch where a friend from Colombia told me that farmers in the country were left with no other option but to grow cocaine as no other crop, in many cases, will give them the opportunity to make a living. Once these crops have been grown, frequently on cleared forestland, it takes a further sixty years before the land can be used again. If you cut the opportunity for a person to make a living, wherever in the world that may be, people simply aren’t going to accept that and die. They will keep fighting for survival and resort to measures that are more and more desperate. Take Kalimantan in Indonesia, for example, where following the unsuccessful introduction of rice, locals resorted to cutting down trees in nearby forests and private land then selling them illegally for a living, increasing the amount of carbon we produce, depleting our natural resources and tearing down habitats all in one fell swoop. Poverty can also affect species in other ways. For example, in southern Zimbabwe, landless people struggle for a place to live and so invade privately owned conservancies for the critically endangered black rhino disrupting their habitat, and potentially poaching them, further threatening the species to extinction. The effects poverty has on the environment can therefore be seen across the world in many different ways. This is where Fairtrade comes in: by giving a premium to people growing and manufacturing products in countries across the world, it ensures that workers do not have to resort to these measures and furthermore supports the local community such that this money can be used to support others, improving their livelihood while also avoiding environmental issues. 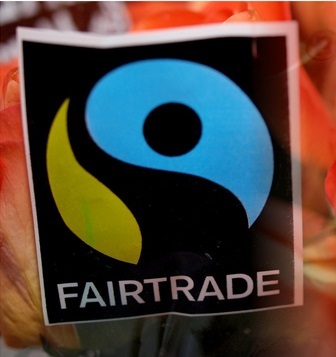 Fairtrade additionally supports the environment in a number of other ways. Firstly, the projects Fairtrade supports are checked by environmental standards, not only to ensure that the projects are sustainable environmentally in terms of the resources they use, but to also make sure that the workers can maintain their work rather than resorting to desperate measures. The scheme also encourages workers to grow produce organically, which can also have tremendous environmental benefits and promotes workers to minimise the amount of energy they use, with the premium they receive often going to environmental protection programmes. Fairtrade farmers in Costa Rica, for instance, used their premium to invest in environmentally friendly ovens, fuelled by the dried shells of macadamia nuts and recycled coffee hulls, as well as to replant trees in order to avoid soil erosion. What this means in reality is that they no longer need to cut forest trees at all, helping further to preserve the rainforest. Similarly, tea workers in India have invested some of the extra money they get into a solar panelled heating system to replaced traditional wood-burning system. These may only be two small examples, but what they show is that environmental messages are being spread to areas of great resources – one of the key areas in which they are needed. The niche Fairtrade occupies therefore is a very important one in that it gives a liveable wage to people in developing, environmentally important countries for sustainable activities. It may not be environmentally friendly to ship these across the globe, but particularly when the produce cannot be grown in the UK (tea, coffee, chocolate and bananas, for example) I strongly urge you to buy Fairtrade. Not only are you giving people a decent living, you are helping the environment and I cannot press upon you enough how important and life-changing those two things are.